The Scientific Drilling (Operational Support Group ICDP) at Helmholtz Centre Potsdam GFZ German Research Centre for Geosciences has various connections to the international airports of Berlin. From inside Berlin there is also good connectivity by various means of public transportation. From the Potsdam-Hauptbahnhof (Central Station) you can walk in 15 Minutes or go by bus to our office building A69 on the GFZ campus. From Tegel (TXL) take Bus X9 to Bahnhof Zoo, change to S-Bahn S7, or RE1, for Potsdam-Hauptbahnhof. Check the trip planner . From Schönefeld (SXF) there are quite a few equivalent routes. Check the trip planner. Choose "From: S Flughafen Berlin-Schönefeld Bhf", "To: S Potsdam Hauptbahnhof". For instance, take any S-Bahn in direction Berlin City Center. When crossing the "Ringbahn" (the Circular Line), change to any S-Bahn running clockwise (S46, S41), until station Schöneberg, there change to S1 for Wannsee, change there on the same platform to S7 for Potsdam-Hauptbahnhof. Alternatively, change from Ringbahn S41/S46 to S7 in Westkreuz. Alternatively, take a fast commuter train through Berlin (RE7, switch to S7 in Ostbahnhof), or travel around Berlin (RB 22). Durations are approximately equal. For public transportation on any route, get a Ticket labeled "Berlin ABC" (3 Zones) and invalidate/stamp it (!) on the S-Bahn platform, or inside a bus. Cost: about 3.40 Euro. 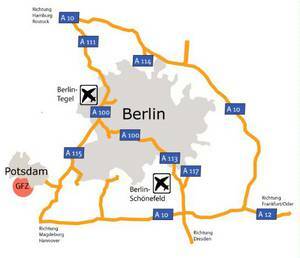 Taking a taxi cab from the airport to Potsdam will cost about 100 Euros.